So, you want to make one of these but you don’t have an ice cream maker? 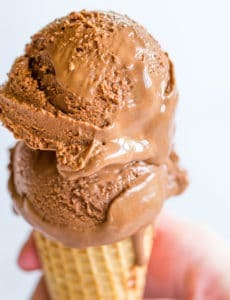 Without a doubt, the most popular comments and emails that I receive following an ice cream recipe in the summer is, “I wish I had an ice cream maker so I could make this!” Well folks, if you don’t have an ice cream maker, you can make homemade ice cream! Much like you can certainly make homemade bread without a bread maker (people were doing that hundreds of years ago! 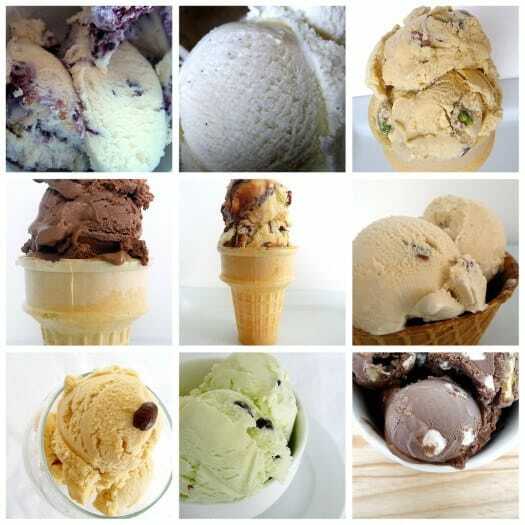 ), you can also create delicious homemade ice cream without an ice cream maker. It takes a bit longer, but the results are every bit as delicious! While the majority of makers are relatively inexpensive now (under $50), I certainly understand how things on the kitchen wish list get assigned a very low priority when there are other things to tend to. So, below you will find a brief tutorial (with links to more in-depth tutorials with photos) on how to make ice cream at home without using an ice cream maker. There are two methods you can use to manually freeze your cream – either with a handheld mixer (method “A”) or completely manual (method “B”). The tutorials linked to below illustrate these different methods. 1. Prepare the custard base as directed in the recipe (including chill time in the refrigerator). 2. Remove custard from the refrigerator and stir with a rubber spatula. Transfer the mixture to a freezer-safe bowl or container (if not already in one). Cover tightly with plastic wrap or an airtight cover. Place in the freezer and allow to freeze for 2 hours. 3. Remove from the freezer and beat with a hand mixer to break up the ice crystals that are beginning to form. Cover and place back in freezer for 2 more hours. 4. Remove from the freezer and beat again with the hand mixer. The ice cream should be thick but too soft to scoop. If it is not thick enough, return it to the freezer for additional freezing time. Beat again. If the ice cream has thickened properly, stir in any add-ins at this point (chocolate chips, cookie chunks, etc.). Do not beat with the hand mixer after the add-ins have been mixed in. 5. Pour into a plastic airtight freezer container, leaving at least ½-inch space at the top. Cover and place the container in the freezer and allow the ice cream to freeze until firm. 2. Remove custard from the refrigerator and stir with a rubber spatula. Transfer the mixture to a deep freezer-safe bowl or container and place in the freezer for 45 minutes. 3. As it starts to freezer near the edges, remove from the freezer and stir vigorously with a fork or whisk, being sure to break up any frozen sections. Return it to the freezer. 4. Continue to check every 30 minutes, stirring vigorously as it’s freezing. It is estimated that it will take 2-3 hours for the ice cream to sufficiently frozen and ready. *Note: David also recommends a hand held mixer for best results, or even an immersion (stick) blender . Cuisinart Automatic Ice Cream, Frozen Yogurt, and Sorbet Maker . ($42) This is the other recommended model by Cook’s Illustrated, which is my go-to source for information on kitchen equipment. I always check out their reviews before making a kitchen purchase. The Perfect Scoop by David Lebovitz. ($13) Not an ice cream maker, but if you’re going to be making ice cream (either with a maker or manually), I would consider this your bible. Not only awesome recipes, but great information on ingredients, equipment, and processes as well. I really like ice cream! and this is a very good recipe. But what is the standard freezer temperature for making ice cream? HI Hellen, I usually keep ours at 0 degrees. I used this method yesterday for vanilla bean ice cream. It was delicious. I want to try frozen yogurt next. Awesome! Thanks a bunch. I have always wanted to learn how to make ice cream without an ice cream maker. Thanks for your guide , i have never tried to make ice cream without ice cream maker, Can’t wait to create beautifull flavors . Thanks again ! Do you have a blueberry recipe I can use your methods to? 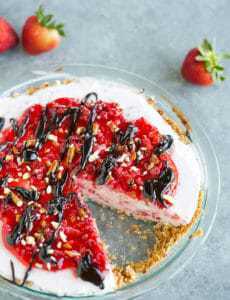 Hi Shana, I have a Blueberry Buttermilk Sherbet (https://www.browneyedbaker.com/2013/08/08/blueberry-sherbet-recipe/) and Blueberry Cheesecake Ice Cream (https://www.browneyedbaker.com/2008/12/28/blueberry-cheesecake-ice-cream/). Thank you for the tips. I just made my first ever batch of homemade ice cream without an ice cream maker. It’s vanilla bean and it turned out so creamy and delicious. I want to try your salted caramel one next. Wow! Really osm! Makes my mouth water. I’m gonna try this for sure! ice cream is such a treat. Awesome post.. will try it definitely , mouth watering :D post!! how can i make cream????? 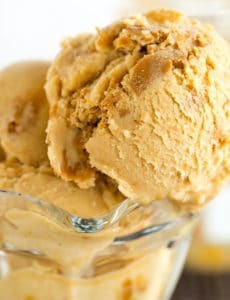 Can’t wait to make this ice cream, you make it look so easy! Hi, thanks, I’ve been trying out various ice cream recipes but with a hard frozen texture. Wanted to buy an ice cream maker which needed to first be frozen overnight and I found it inconviniencing. Had an idea of stirring the mixture while it’s in the freezer and I am grateful for this info. A lot of my readers live in Peru and Ice Cream makers are not a normal house appliance so I was hoping to include a more classic approach. The way you have explained it is so perfect that Id just like to copy and paste it. Can I? Id also translate it into Spanish. Of course I´ll include a link to http://www.browneyedbaker.com . Would a mason jar work as a container? Hi Megan, Technically, yes, but mason jars aren’t very large and I’m not sure how you’d be able to scoop ice cream out of it!